How does the tall grass affect your golf experience? If you’re a fan of golf course architecture, you’ll appreciate the fact that the course was designed in the links style. This by nature means very few trees, and fairways surrounded by tall grasses. Links style courses such as St. Andrews in Scotland are where golf began. The tall grass will encourage you to think more carefully about your tee shot. If you hit your ball into the tall grass, it can slow you down because you may have to look for it, and it can make for a challenging shot. Last of all, the tall grass is a beauty for you to behold. It becomes golden brown in the fall, and as you stand at the tee, it will take your breath away. 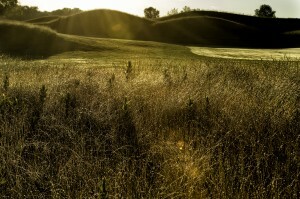 The tall grass surrounding 12 green at sunrise.